I’ve owned several pairs of Sidi’s long-running On Road Gore-Tex Boots. I was excited and nervous when I heard there was a replacement in the works. Excited, because Sidi makes killer boots (I own five pairs) and nervous, because replacement products don’t always keep the mojo and awesomeness of the original. I’ll admit that I was a bit crestfallen when I heard the replacement, the All Road Gore-Tex, was a textile-based boot. This wasn’t based on any particularly thoughtful examination of leather versus textile / synthetic boot construction; in fact, my daily commuter boots (one of the five pairs of Sidis mentioned above) are synthetic, and they’ve served me well. But I’ve always really liked the simple, classic leather boot that the On Road was. I shouldn’t have worried. Right out of the box, it’s clear that the All Road boot is made for serious riding (and that’s just what they’ll do). In many ways, these boots are an interpretation of the On Road, in modern materials: a simple and straightforward, mid-calf boot without much flash. Like the On Road, there are two straps on the lower part of the boot, and a bigger closure on the calf—all Velcro or hook and loop or whatever the kids are calling it these days. The lower straps feature an ingenuously toothy, red addition to the lower straps, designed to keep the straps from loosening up. For some reason, I’m predisposed to distrust such innovation, but it works quite well—in my experience with the All Roads, those toothy little dealies keep the straps exactly where I put them. And they’re easier to tighten up than the double loop system on the On Roads. 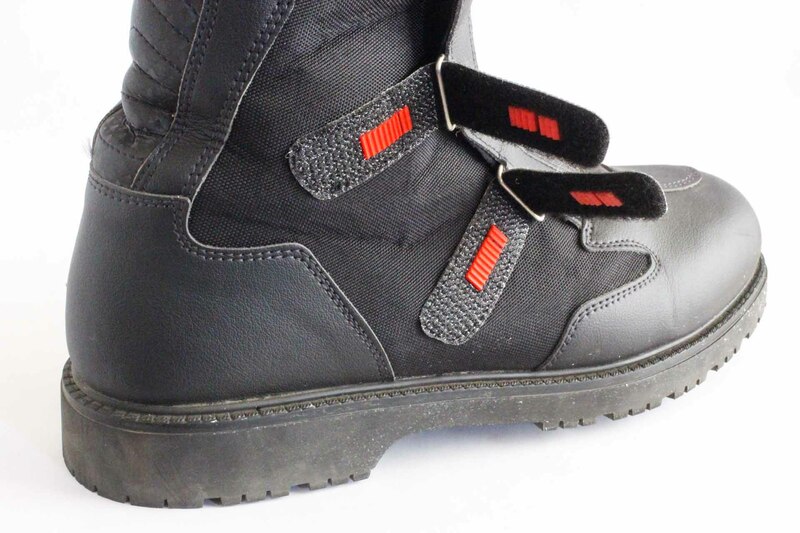 I prefer simple boots that are easy to put on—my Sidi Adventures push the limits of my patience with all those buckles. No such issue with the All Roads. Soles are the same workboot-esque lug affairs found on the On Roads. Upper construction is textile (Cordura?) and Sidi’s own leathery looking synthetic Techmicro. These materials achieve a magical balance of stiffness and comfort, and are substantially lighter than the On Roads they replaced. My size 48 All Roads (size 13 for you Real Americans) weigh in at 2.43 pounds each, versus 2.97 pounds for the same size On Roads. That half pound difference has gotta get me another MPH or so at the top end, right? There’s Gore-Tex for breathable waterproofiness. If you haven’t worn a Gore-Tex boot in a downpour, well, I’m sorry for you, son. I like my feet to stay dry, and Gore-Tex makes that happen. They stand behind their “keep you dry” guarantee, too. My last pair of On Roads had been abused worse than our “justice system”—they had over 40,000 miles on them, and looked like relics from World War II when they started leaking after about 5 years. Gore-Tex sent me a new set, with nary a protest of “Seriously? What have you done to these things?! ?” Nice. I mentioned comfort—I put them on for a photo shoot, and within an hour was confident I could wear them all day with zero issues. They’re basically ready to go, right out of the box—no break-in period required. I almost always wear my boots inside my pants, so I appreciate that the All Roads are quite svelte. They fit nicely inside even snug, Euro-style riding pants. Second, and more importantly, the All Roads are light on protection, just as the On Roads were. This didn’t stop me from piling the miles on the On Roads, and it won’t stop me from doing the same in the All Roads, but if your idea of “safe boots” includes Terminator-looking joints and armor everywhere, the All Roads will disappoint you. These are basically touring boots—the toe box is nice and stiff, there’s a bit of ankle armor and some padding in the shin, but nothing that’ll stop your ankle from being turned into a boot full of meaty pudding if you put your leg between a rock and a hard place. Or a bumper and a bike. 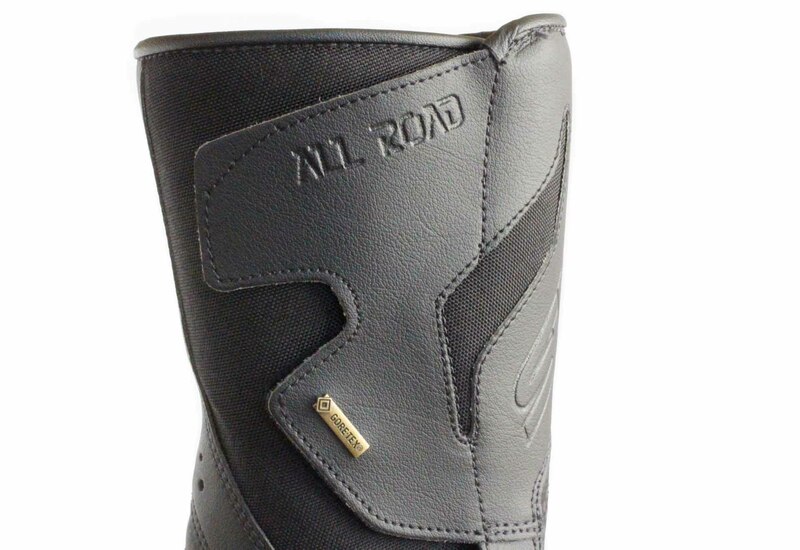 That said, Sidi’s new All Roads are really great for utility and touring riders looking for a waterproof boot. And get this—at just $325, they’re actually less than the On Roads they replace. I found them easy to get on my tootsies, flawlessly waterproof, thanks good old Gore-Tex, and crazy-comfy from the git-go. Hell of a deal. $325. Get a pair or find your local dealer at motonation.com. The Solution Boots work just fine for $130 (or less). I have no stake in them, just sayin’. Are the soles stiff or flexible on the solution boots? flexible,they wear down pretty quick when used for normal walking around also.They’re decent boots but not the quality of Sidi’s.I have a pair of Solutions now but will replace them with something else,don’t know what yet. I’m a cheap bastid. I’ve had a couple pairs of these & like the fit right out of the box. “…at just $325… Hell of a deal.” Surj— Nice review overall, but that’s 1-percenter talk when you describe a boot over $300 as a good deal. Your income, or mindset (whichever is loftier)is not in tune with common folk. Please keep us ordinary riders in mind when you write. That said, you sure know how to spin a phrase. “…meaty pudding” is not only descriptive but quite visual. Keep up the good imagery and good work! This argument is old and tired. People blow thousands of dollars a year on stupid stuff and then say they can’t afford this bike or that gear. Its about priorities. Here’s a couple of ideas; $600/month lease payments for your car/truck/SUV? Instead of blowing 10 bucks on lunch every day, make yourself a sandwich. Drink some water instead of so many beers. Give up smoking. Going to the movies and buying popcorn and soda for two is about 50 bucks. Eating dinner out 10 times a month…buying premade food, spending 100 bucks on jeans or 30 dollar Affliction T-Shirts, 1000 dollar weekends in Vegas. If you fancy yourself as a motorcyclist, prioritize your dough. Now that argument is just as old and tired and unfair as Andy’s. You have no idea how he spends his money, and you’re assuming that he isn’t prioritizing his dough. I know plenty of people that consider paying a $200 premium for a pair boots “stupid stuff”, no different than buying a $30 Affliction T-shirt over a $10 discount store one . Maybe he’d prefer to put that $200 towards a trip to Vegas or a pair of gloves or 30 trips to Starbucks. It doesn’t make him any less a motorcyclist than you or anyone else. He merely has his own perspective on the value of the product. Andy’s “1-percenter talk” comment is no different than yours. He is just coming at it from a different angle. Gotta’ go with Blackcayman on this one though I’m normally a ‘live and let-live’ kinda’ guy. If this were Vegas daily or Starbucks Daily, I’d understand comments complaining about the prices of something we’re not all into. This is Motorcycle Daily though… we’re all enthusiasts and let’s face it. No one ever gave me a bike… or gear to go with it. This is not a poor man’s hobby. I just spent $300 on a pair of top end hiking boots because I’m an enthusiast. Otherwise, I’d pay $39 and get my.. achem… hiking boots from Walmart. If you ride your 1973 Honda 750 clad in gear that more closely resembles a rodeo clown than a motorcycle rider, then perhaps this isn’t where you should be getting your product information. For you, try Value Village. If, however, you are a true enthusiast, and appreciate all that our sport offers, you’ll get value out of the opinions of the writers on this site. The price for admission to much of what is profiled here can take a good whack out a paycheck for most of us. The difference is… that’s what we do… it’s who we are. Quality costs money, no matter what activity you’re into. Damn those SB Venti Double-shot lattes are expensive. It is all about priorities. Life presents an endless supply of opportunities and things to prioritize our desires and income on. Someone who rides their bike most everyday may feel the need for greater weather and accident protection than a more casual rider and be willing to invest more.It’s like everything we do. Some drive an older car because as long as it’s running they don’t want the added expense of a new car while others wouldn’t be caught dead in something more than a couple of years old. Choices. The velcro is the one thing that is failing on my OnRoads. The hook & loop has separated from the leather strap. I’d replace them, but the rest of the boot is fine. I wonder if Sidi would stand behind the problem? Being as I am I’d just fix it myself unless within a warranty period. There are many adhesives that will fix your problem permanently. If you don’t want to bother, any shoe repair shop can easily fix you up for just a few bucks. Why replace the boot when it’s an easy fix? Is it easier to contact Sidi, package up the boots, send them back, wait for the new replacements to arrive and go through whole process of breaking them in (again) or just take them to a Cobbler? I have been fixing them myself. Mostly, I’m disappointed that a really expensive pair of boots has a flaw that big. Every single strap has failed, but the soles are still in good shape; it’s obviously a weak link in the boot design. Sidi should know about it, and they won’t listen, unless they get returned. Under $100 will buy similar lace up Gore Tex work boots. I’ll bet these are as good as they say BUT they are grossly over priced. Cycle Gear, Competition Sales, etc. may offer them at a discount but they will still be a lot more than other brands. I’d have to agree. I used to buy Alpinestars and Sidi boots exclusively and when the sole starts to go the boot is gone, and the all metal pegs on a sport bike I had ate two sets of soles. I bought pair of perforated Bilt boots one Summer when I couldn’t stand it in the Alpinestars any more (long tour and I was 4 states away from home), and for $80 they could not be beat. I replaced the Alpinestars when the zipper went out with another pair of Bilt boots and have not gone back to name brands since. I’m still a glove snob, but when it comes to boots I think the fancy brands (in the general road and touring category) have priced themselves out of the market. Race boots are another matter, but it’s just too easy to pick up a good pair of good fitting, water proof yet breathable boots with good shin and ankle protection for under $150. Nice. A new boot I can add to my old and resoled Sidi On Road and newer Sidi Canyon boots. My problem with hook and loop is that it weakens after many duty cycles. Will it last as long as the rest of the boot? It depends on the quality of the material; something I cannot gauge from the article. I like the stability of wide, thick soles (like work boots) for walking, but my personal experience of the leverage that feature can exert on the bones of the lower leg says not to wear them. In my case, the result was what’s called an inverted fracture of the fibula. That injury was NOT from the featured boot, but another with work-boot like design, and importantly a lower top. No boot is perfect, but that’s my experience; YMMV. As a user of Sidi’s cycling shoes, I can tell you that their velcro is the longest lasting I’ve ever experienced. I have have experienced that problem with other shoes and clothing products, but my most “used” Sidi’s velcro (10 years old) is still going strong, all the way to the edges of the straps. +1 to that. I have a set of Sidi’s that is now into the 15th season of riding (a lot.) 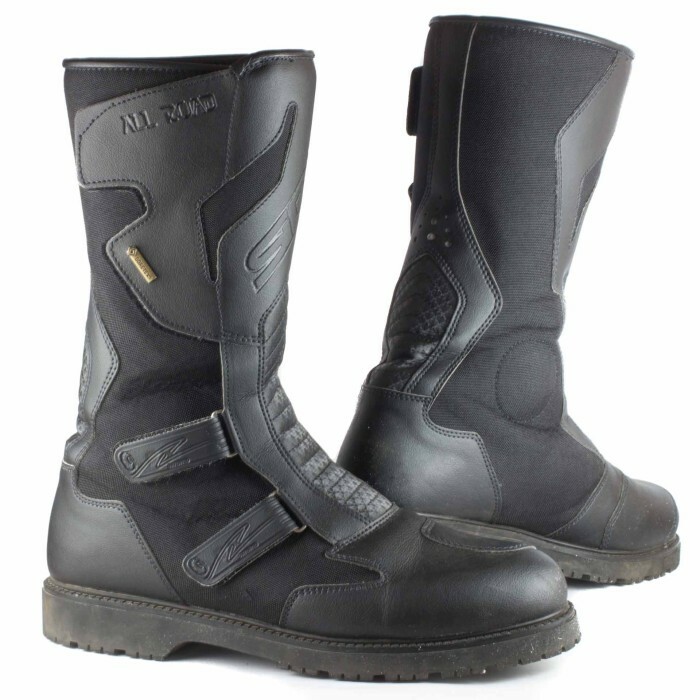 Resoled 2 yrs ago, walked and ridden hard on street, track, baja and ADV-style riding. The velcro still works fine. I clean forest debris from it once in a while and ride on. Probably one of the top three values in gear I own. I have some Aerostich Combat (Sidi) boots and the Velcro only lasted a year or so. I’ve had the boots now for five or six years but the flaps always flap. I do wear over-pants over the boots so it’s not that bad. Indeed. It’s worth noting that the velcro on 40,000+ mile On Roads, mentioned above, was still working just fine. While they may not help protect the ankle and foot in a train wreck I’d be willing to bet they protect well in your everyday, run of the mill get-offs. Will they fit over my thick calves and ankles? It doesn’t look like they would. Hey ABQ. I don’t have especially thin calves, and they fit me fine, as did my On Roads and my Adventures. Of course, try ’em on, but they’ve been fine for me. Nice boots, but come $325? Really? Not worth it. It all depends on the value you place on your feet. These boots are a great value! A good pair of off-road boots go for twice that these days. That said, I have a low cut pair of Alpine Stars (that I love) for street riding that I paid about $150 for. Sidi sure makes great products. Nice to see others recognize, acknowledge and praise the products. When I started using their MX boots, my ankle issues went away. I’ve been using both their on and off road boots for years now. I also began using their cycling shoes this year. All good stuff. Their MTB shoes are the best. Finally a great replacement for my really old On Roads that are my “go to” boots regardless of the other ones that live in my shop..